Let me begin by stating that I'm careful with things. Like an Entwife, I prefer order, and plenty, and peace. Wanton destruction is something I can't remember indulging in even once in my entire life, and I make the following confession with a contrite heart. Caution: this post contains possibly disenchanting revelations. If you have fond recollections of the Happy Apple and prefer to let its inner workings remain an enigma, please don't read on. 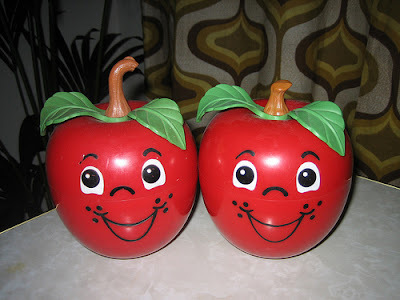 Fisher Price retired the Happy Apple after 1974, which is odd considering the toy's popularity, and sad because quiet lovely sounds are always good for people no matter what their age. Although it was made to be patted, batted, and swatted by tiny flailing hands, the Apple is best savored when held close to the ear and just barely shaken. If Fisher Price could make a minimalist version for the present day, unencumbered by perilous foliage and minus the rather overly-insistent grin, they'd sell jillions. I'd buy one in a heartbeat. And now for the regrettable part of my tale. Always keep in mind while reading further that my Happy Apple was nowhere close to mint condition when I acquired it at the local Goodwill some months ago. Shorn of its stem and greenery and covered with a heavy patina of scratches, it looked all of its nearly forty years, but from its secret depths emerged the most lovely celestial harmony. Many people are that way, with a world-worn exterior masking inner resonance. The poignancy of the notion moved me, and the 99-cent price tag seemed a killer steal. After I got Happy home and gave it a scrub, I kept it on the table next to the sofa where I like to write, and at intervals when I required inspiration I'd rock it and swirl it, letting its soft tolling like distant temple bells imbue me with serenity. What a wonderful toy this must have been, imparting to a child the lesson that the more gently something is handled, the more its beauty will appear! The Happy Apple could have fallen from Buddha's bodhi tree. But the serpent had entered the garden. Peace fosters the spirit of inquiry, and eventually Happy's deep delicate tones caused me to muse "what's inside this battered tchotke creating such an exquisite, angelic sound?" Not wishing to expend effort that would destroy the object, I looked all over the Internet for an answer but found none, which astonished me. People are always tearing stuff apart, so I expected to find at least a few YouTubes or gleeful accounts of someone taking a sledgehammer to a Happy Apple, but no. 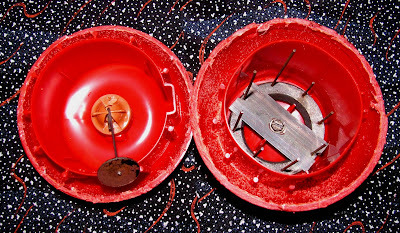 The toy had existed long before the Internet, and had achieved a venerable prestige. The few YouTube videos that chanced to feature a Happy Apple tended to show closely-watched infants interacting with what was clearly considered a cherished family heirloom. Still, Happy Apples aren't all that rare since they were produced in the many thousands during their brief time of flourishing, and I was relieved to find that they can still be readily acquired online, stem and leaves intact, for a nominal price. Reassured by their availability and unable to control my curiosity any longer, yesterday I took a compass saw and went to work, severing the fruit along the weld line in the middle. Happy turned out to be a toughie despite its disarming smile. It's hefty, about the size of a small cantaloupe, so it wasn't easy to hold steady on its side. To add to the difficulty its plastic was as thick as harness leather, which meant I had to saw around the complete circumference before the halves finally came apart. As I worked, I frequently stopped and gave the Apple a shake to make sure I wasn't wrecking the mechanism within, and it always chimed reassuringly. As I got closer and closer to my goal, however, I began having trepidations. 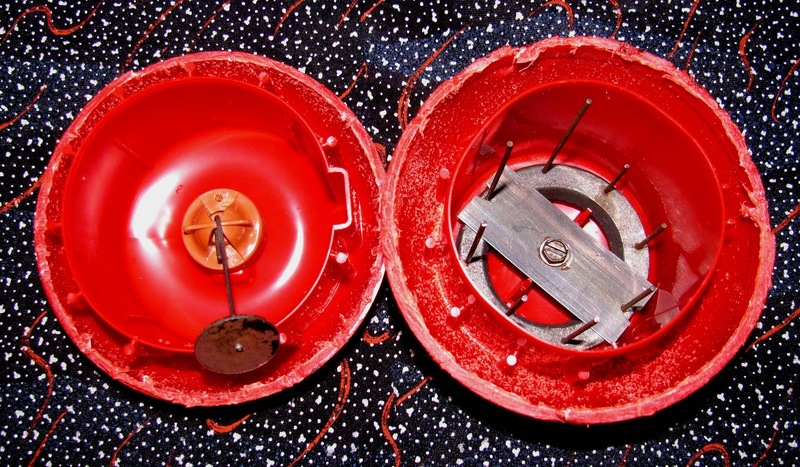 What if I accidentally cracked open a hidden chamber of mercury, spilling it everywhere? What if it for no reason at all the thing caught on fire? What if what lurked inside was really a malevolent alien being who'd been waiting nearly forty years for liberation? The chances were remote, but you never know. Worse than any of those possibilities, what if I ended up destroying whatever caused the beautiful sound? I began to feel a bit like Eve must have when she handled her apple. But none of those dire mischances occurred, and here's what I found. Click the image for a larger view. The Happy Apple's core exposed. I'd never have guessed that the mechanism was so simple. I'd envisioned spheres within spheres, delicately balanced and calibrated, only too capable of falling apart beyond any recovery once the Apple's secret was unlocked. Instead, I found a little circle of eight metal rods in different lengths in the lower part, struck by a swinging metal disk suspended from the top section, very much like a fixed set of wind chimes. The components of this ingenious gong were of springy steel tough enough to withstand the wear of decades. And there you have it, another of life's mysteries solved. While I regret sacrificing a vintage treasure, I take heart in knowing that my discovery may save countless other Apples in far better states of preservation from a similar fate. Since my Apple's aesthetic appearance, if it can really be said to have had one, is now impaired, I plan to remove the mechanism and house it in something made of natural material like wood or bamboo or gourd. That way I'll be able to enjoy its lovely harmonies in a form rather more dignified and decorative than a plastic fruit with a goofy grin. Still, I'll always remember Happy. Postscript added April 28, 2015: This is one of my most popular blog posts, and I'm delighted it's attracted so much notice. Since I'm best known for my fiction writing, I hope you'll visit my website for free short stories and chapters of my novels. Thanks and happy reading! News -- December 4, 2015: "At The Core Of The Happy Apple" is now available as an e-book at Smashwords, which distributes to Barnes and Noble, Kobo, and many other retailers (including Apple! ).